The Downing Mountain Lodge is the unique mountain lodge located in one of the most interesting mountain ranges and valleys in the Northern Rocky Mountains. At the Downing Mountain Lodge, the delivery of an authentic mountain experience is our passion. Whether you are looking for a vacation home rental, an outdoors adventure lodge, a special event destination, a fine dining experience catered to your wishes, a private wedding location, or a mountain meditation and team-building retreat, the Downing Mountain Lodge will provide you with privacy, comfort, and amazing views from two thousand feet above the Bitterroot Valley. At a crossroads of culture and environment, the Bitterroots blend a combination of Pacific Northwest influences with the Rocky Mountain West. Moderate elevations and increased rainfall combined with abundant sunshine makes the Bitterroot Valley one of the best destinations in the Last Best Place. From cattle ranches to organic dairies and produce farms, cafes to sushi restaurants and fine dining, flea markets and thrift stores to antique stores and boutiques, small towns to large university towns, high mountain lakes to creeks and swollen rivers, music events to rodeos and farmer's markets, and the greatest concentration of micro breweries in the region,Western Montana has much to offer the traveler and resident alike. Do come and see for yourself. Our rates vary with the season and from weekdays to weekends, from $50-$100 per person with a four person payment minimum in the summer. 7% lodging tax will be added to all overnight stays. Rules like these are meant to be flexible so get in touch and let us know your needs, we are happy to try to accommodate folks in a variety of financial circumstances. 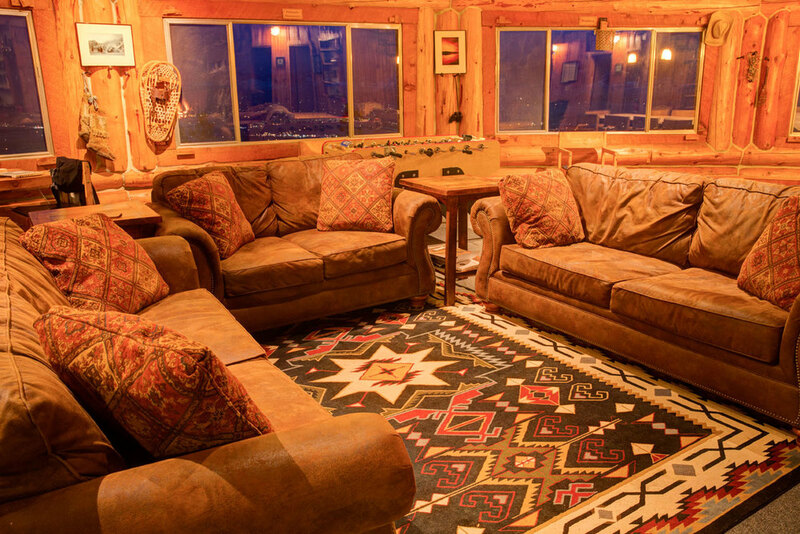 Downing Mountain Lodge offers a unique location and structure for different types of retreats. 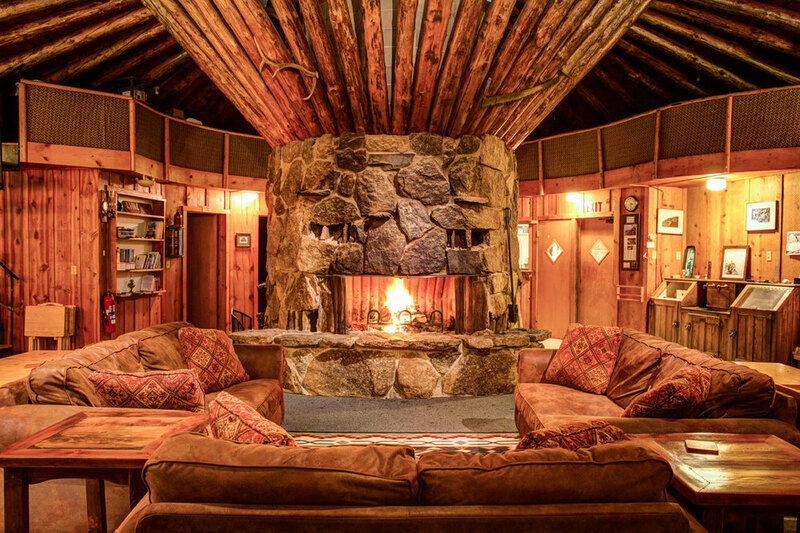 Built in the round, the living room faces the large fireplace and can be configured in ways to best suit your retreat's needs, whether it be spritual, corporate, yoga, meditation, veterans, scrapbooking, and others. As owner managers, we work closely with our guests to provide them with the service they want. With windows facing the mountains and valley through each of five wall panels, there is abundant natural light and views. We have been successful hosting all the above styled retreats and always look forward to our guests' creative ways of using the retreat center space. 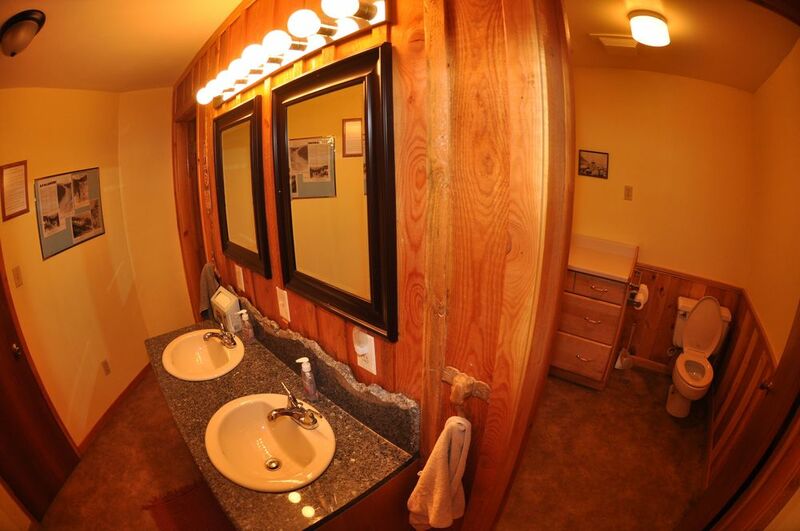 With three bedrooms and two bathrooms, the retreat center can easily accommodate ten overnight guests and some push it to 15 by using the double beds and loft. The occasional wedding party sets up tents for larger groups of overnight guests. Guests are free to move furniture around to best utilize the space. We have storage capability if the need arises to fully remove items from the living room. With any of the listed ideas, we have personal experience and are available to help you with adventure consulting. If there is anything else you may be interested in experiencing please inquire. There is great hiking on Downing Mountain right from the lodge. Head directly up the ridge behind the lodge to your heart's desire. There are subalpine tarns two thousand feet up, a rugged mountain ridgeline hiking tour that culminates at Downing Mountain, and Barley Lake hidden down in the forest below the Crown Point. Closer to the lodge are two separate and small creeks to hike to within fifteen minutes, both with trails leading to them. With a rocky promontory close by with abundant huckleberries to pick in August and Septmeber and open Ponderosa glades to stroll through fields of Spring wildflowers, the views from the lodge property will have you as breathless as the hiking. Additionally, many of the canyons in the Bitterroot Valley have great hiking trails as do some of the faces and peaks. One our favorites short trails is the Blodgett Overlook from Canyon Creek trailhead a thirty minute drive from the lodge. A great hike for all ages and abilities Canyon Creek is one of the closest trailheads to the lodge. A three mile round trip hike to a beautiful overlook of Blodgett Canyon, the inspiring view up Blodgett Canyon at the granite towers of Blodgett Canyon will make you want to hike up to or climb them. Blodgett Canyon, the next to the north, is a great hike and rock climbing destination with extensions to High Lake and Blodgett Lake for the all day hikers. Canyon Creek trail accessed from the same traihead as the Blodgett Overlook is moderately strenuous and leads to a series of two mountain lakes and is full of wildflowers late in the season. These trailheads are all within a thirty minute drive to the north of the lodge accessed off Westside Road and then Canyon and Blodgett Roads and are good options as you never need to drive on the highway. Heading south accesses four other great hikes: Sawtooth Canyon, Goat Peak, Roaring Lion Canyon and Ward Mountain. These four hikes are all accessed from Roaring Lion Road also from Westside Road without having to drive on the highway. Ward is a thigh-burning, high peak with about 5,000' elevation gain to a lofty rounded summit with amazing high mountain and valley views. Roaring Lion is a deep and moist canyon with a beautiful creek and cedar groves, Goat Peak is a short steep hike to a lower summit, and Sawtooth is a nice foothills walk before ascending another remote and beautiful mountain canyon on the backside of Downing Mountain. Check out summit post's website, http://www.summitpost.org/bitterroot-mountains/170887, or local author Mike Hoyt's book Bitterroot Mountain Summits for more information on hiking Montana's alps. With five convenient access points to the Bitterroot River near the lodge, this cold water fishery continues to provide locals and visitors with great times fishing, tubing, paddling, swimming and picnicking. Angler's Roost, West Side Bridge, Hieronymous Park, Veteran's Memorial Bridge, Blodgett Park, and Woodside Cutoff are all access points to the Bitterroot River within thirty minutes of the lodge. Westside Bridge, the closest, is the nicest for a stroll along the river, swimming, picnicking, and wade fishing. Angler's Roost to Blodgett Park or Woodside Bridge are the best local sections for floating either by raft, canoe, kayak or inner tube. A moderately swift river with few obstacles in these section other than logs, one rapid, and turns in the river, the river appeals to most people's desires and sense of adventure. As with all moving water, having experience and wearing a PFD are necessary. There are numerous fishing shops in Hamilton and we can help you with choosing a float fishing guide if you desire to raft fish the river. There are Bitterroot River maps available at the Bob Ward's Sporting store in Hamilton or at fishing shops in town as well. As the most popular national forest service destination in the northern region, Lake Como provides great views of the high peaks, a wonderful paddling destination, a swimming beach, hiking trails, a paved walking trail, mountain biking trails, a powerboat launch, jumping cliffs at the far end in high water, and another canyon trail to high mountain lakes into Idaho. Adjacent to Lake Como is Lost Horse Canyon with gravel road access deep into the wilderness to other high mountain lakes and trails into the Selway Bitterroot Wilderness. Also a popular destination for rock climbing and bouldering and picnicking on the banks of this large creek. Check with the Bitterrot National Forest office in Hamilton for more information about Lake Como. Some of the day use areas require a fee that can be paid with cash in a self service envelope. In addition to the Bitterroot River near Hamilton, there are many tributaries with good fishing: Blodgett Creek, Lost Horse Creek, Bear Creek, and both the West and East Forks of the Bitterroot. The Selway River in Idaho over Nez Perce Pass is an exceptional Cutthroat Trout fishery with great wade fishing opportunities. Rock Creek a world renowned blue-ribbon fishery is over Skalkaho Pass and has also great wade fishing opportunities. The Salmon River has steelhead runs that attract fishermen from afar. Lake Como and Painted Rocks Reservoir have good lake fishing and there are numerous mountain lakes with good fishing in the summer months. There are numerous fishing stores in town that can help you with fly patterns, equipment, and destinations, and we have guides that we recommend to people wishing to float fish the river. The Bitterroot is great for both road and mountain biking. Mountain biking on the loop road at the lodge is fun for the fit biker with its two thousand foot climb and descent. Mountain biking down from the lodge and to town is a fun ride for anyone who arranges a shuttle with their party or calls us for a shuttle back to the lodge. The West Side road loop is a popular road biking trip into town and has a bike path along highway 93. There is a bike path north from Hamilton to Lolo for 35 miles of paved riding. Road rides looping along the west side of the Bitterroot River incorporate Westside Road, Ricketts Road, Bowman Road, Cherry Orchard, Lower Mill Road, Sheafman Road, Canyon Road, Blodgett Camp Road and Red Crow Roads. A good local road map is available at the Chamber of Commerce office at Main and 1st street adjacent to Safeway and the Bitterroot Brewery. With light traffic a few hills and good pavement this is a perfect place to enjoy a solid road riding workout with amazing mountain and valley views. The Bitterroot Valley is along the Bike Across America trail and we welcome any through bikers to spend a few days enjoying the mountains. We are happy to provide shuttle service for anyone to the lodge. Mountain Bike trails are in abundance in the Lake Como area, at Skalkaho Pass, in Warm Springs Creek, and from Lost Trail Pass. Additional trails up the West Fork of the Bitterroot are good and Fred Burr Canyon hosts a two track trail to Fred Burr Lake. Nez Perce Pass up the West Fork Road is another great ride for its remote pavement section and access to the Selway Bitterroot Wilderness. Missoula hosts some great trails in the Rattlesnake corridor and there are mountain bike races every year in Missoula. With two excellent bike shops in Hamilton, Valley Bike, http://www.valleybicyclesandski.com and Red Barn Bikes, http://www.redbarnbicycles.com, finding service for your bike, other riding ideas, or parts is easy. The Bitterroot Mountains hold some of the best rock climbing in Montana. From the high granite towers of Blodgett Canyon to the Boulders of Lost Horse, there is something for every climber within half an hour of the lodge. Starting in the north, Kootenai Canyon has mixed sport and traditional climbing routes on the cliffs just off the trail and a ten minute hike from the trailhead. From 5.8-5.12, this area is one of the more popular and earliest developed climbing areas in Montana. Mill Creek further south and much closer to the lodge has been developed in the passed few years as one of the premier intermediate to advanced sport climbing destinations with a high concentration of good routes 5.8-5.12 with bolts spaced for safety and beginning lead climbers. http://millcreekreport.blogspot.com/ gets you to much of this areas route information. Additionally there is the multi pitch, traditional routes on the No Sweat Arete and Dihedrals East. In Blodgett Canyon, there is a sport climbing wall at the Parking Lot Wall, and numerous high towers upcanyon on which to try your traditional climbing skills. Starting in the east is the Prow Buttress, then the Drip Buttress. Further up canyon is the Blackfoot Dome, the Kootenai Buttress, the Nez Perce Spire, the Shoshone Buttress and the Flathead Buttress. With hundreds of pitches therein, Blodgett Canyon is the pinnacle of climbing in the Bitterroot Valley. At Lost Horse Canyon there is bouldering in the valley and good traditional and sport climbing on the crags to the north of the creek. There are good stretches of whitewater with rafting outfitters on the Clark Fork River in Alberton Gorge west of Missoula (Montana River Guides-www.montanariverguides.com and Lewis and Clark Adventures http://trailadventures.com/), the Salmon River over Lost Trail Pass with Kookaburra Outfitters (http://www.raft4fun.com/category/trip-type/idaho-whitewater-rafting-trips), or you can rent your own raft with Blackadar outfitters (http://blackadarboating.com/), and the Lochsa River with Lewis and Clark adventures over Lolo Pass. These adventures take the better part of a day and can be set up in advance with the outfitting companies. If you have your own raft or kayak, the Bitterroot Valley is well located to take advantage of some world class boating opportunities: Clark Fork at Alberton Gorge, Class 3 big water, West Fork Bitterroot Class 3 small water, Lochsa River Class 3-4+ medium water, Selway River Class 3-4+ medium water, Salmon River Class 3 big water, Rock Creek class 3 medium water, and the Blackfoot River class 2-3 medium water. Additionally some of the creeks in the Bitterroot are run by creek boaters: Kootenai Creek, class 5; Bear Creek, class 5; Lost Horse Creek, class 4-5; Rock Creek outlet from Lake Como, class 4-. All these rivers and creeks can be reached and boated in a day from the Downing Mountain Lodge. 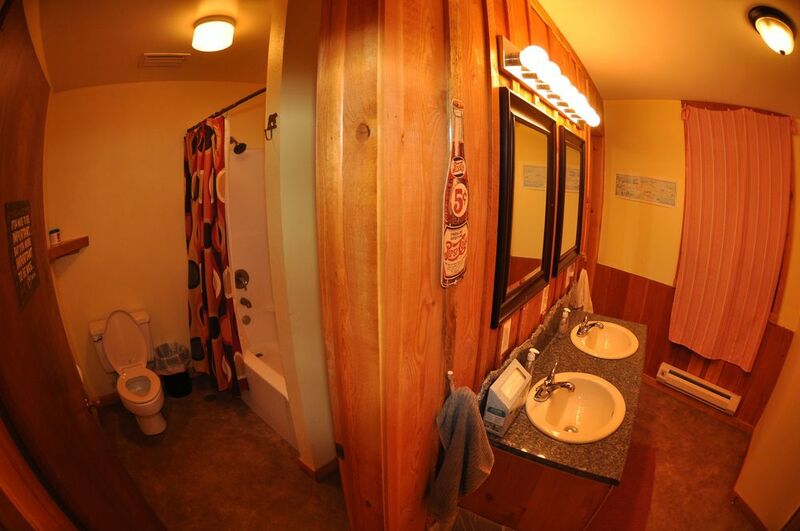 Enjoy the two creeks, nature walks, or hiking at the lodge or head down the mountain via car or bike to discover possibilities in Hamilton, the Bitterroot Valley and beyond. Bitterroot Aquatic Center (www.bitterrootaquaticcenter.com) Pool and Slides. Canyon Hideaway- a community built playground and grassy fields on main street on the way to or from the Downing Mountain Lodge. Grab some bread and go feed the ducks. Located 2 miles up Golf Course Rd on the north side of the road. An easy 3 mile roundtrip hike to a great vista of Blodgett Canyon. Enjoy the beach in the mountains! (Named after Lake Como in Italy) If you get bored laying on the beach take a walk along the trail that circles the lake. There is a $5 vehicle charge for parking at this Forest Service recreational site, payable by envelope at the beach. Learn about the founder of Hamilton, Copper King Marcus Daly, on a tour or enjoy some of the great community events sponsored here every summer from music festivals to powwows to civic gatherings. First Fridays- Held the first Friday of every month from 6p.m.-8p.m. Marcus Daly Memorial Hospital- Also on main street on the way to or from the Downing Mountain Lodge between the river access and the park.